With this product you can accumulate up to 387 Glitter Points. Fights the main signs of age. 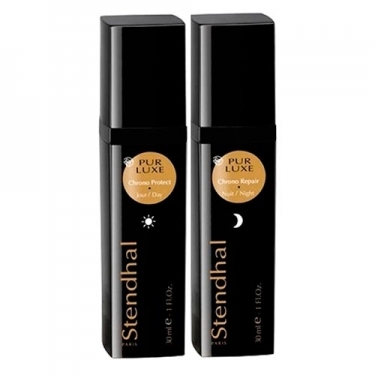 DESCRIPTION: Pur Luxe Cure Chrono Repair from Stendhal is an exceptional treatment and a true total booster of anti-aging. Inspired by Chronobiology and Gemmotherapy, it aims to rebalance the smooth functioning of the skin by synchronizing its natural rhythms and enhancing its protective functions during the day and repair functions at night. Apply in the morning before makeup and at night before bed.